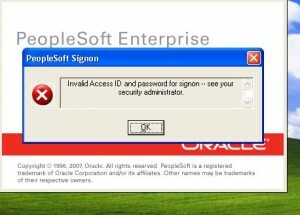 You are here:Jamie's Blog > PeopleSoft > PeopleSoft Invalid Access ID and password for signon — see your security administrator. PeopleSoft Invalid Access ID and password for signon — see your security administrator. When trying to connect to Data mover or Application designer the following error (“PeopleSoft Invalid Access ID and password for signon — see your security administrator.” ) comes up even though you are inputting the correct user/pass combination. 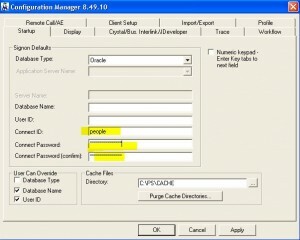 Verify that the connect ID and Connect password is correct in the Configuration Manager. 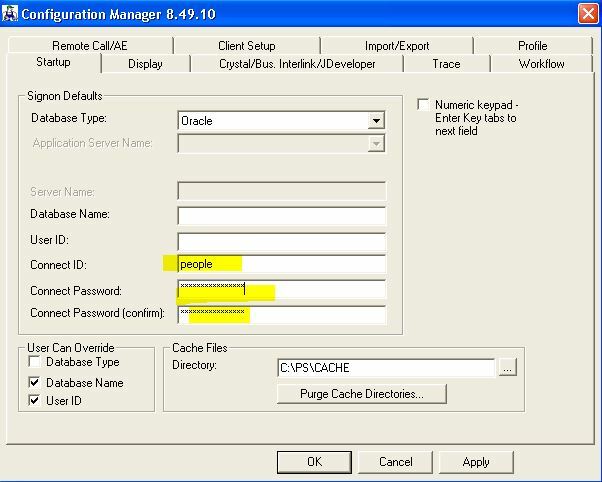 This ID allows PeopleSoft to connect to the database to verify that the user/pass is correct. Getting that after refresh of the database from the backup of another database. Connect ID is definitely correct – it is the same on both databases and I verified it. The error still persists. Is the psdbowner table correct?